San Pedro police followed up on a man who discharged a firearm in public and ended up finding a stash of cash, weed and contraband. Last night, police got a report that a town taxi man had fired his licensed pistol in front of a bar. License or not, that is an offence, and police went to search his home in the San Pedrito area. They found 30 year old Juan Menjivar and a 15 year old male relative in the house and recovered the loaded Sig Sauer pistol without incident. 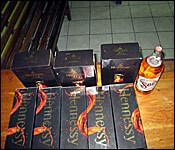 But a search of the premises then turned up more than $10,000.00 in US and Belize currency, (8) liters of Hennessy and 3 brown parcels containing 1.4 kilos - or about three pounds of weed. 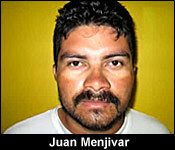 Both Menjivar and the 15-year-old were arrested and charged for Drug Trafficking while Menjivar was additionally charged with Discharging a Firearm in Public, Uncustomed Goods and for the possession of over $10,000 dollars believed to be the proceeds of Drug Trafficking. He will be arraigned tomorrow. On Sunday July 20th at 11:00p.m., police visited the residence of Juan Menjivar located in the San Pedrito area of San Pedro Town investigating a shooting incident which had allegedly occurred on Saturday July 19th in the DFC area of San Pedro. At the house, police met a 15-year-old male of Hispanic descent of San Pedrito area and 30-year-old Juan Menjivar who produced his licensed black 9 millimeter SIG SAUER SP 2022 with eight 9mm live rounds in the magazine. 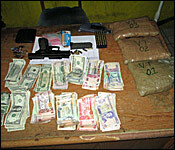 Further searches of the house led to the discovery of over $10,000.00 in US and Belize currency, eight (8) liters of Hennessy and 3 brown parcels containing 1,413 grams of cannabis.